Effective and safe performance of cardiovascular interventions requires excellent catheter / guidewire manipulation skills. These skills are mainly gained through an apprenticeship on real patients, which may not be safe or cost-effective. 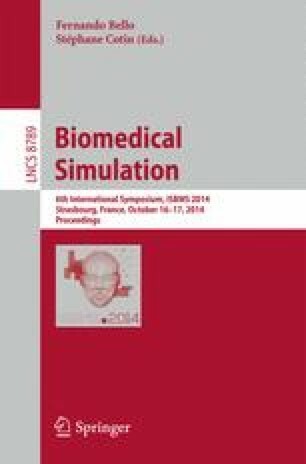 Computer simulation offers an alternative for core skills training. However, replicating the physical behaviour of real instruments navigated through blood vessels is a challenging task. We use an inextensible Cosserat rod and impulse-based techniques to model virtual catheters and guidewires. This allows an efficient recreation of bending, stretching and twisting phenomena of the material in real-time. It also guarantees an immediate response to user manipulations even for long instruments. The mechanical parameters of six guidewires and three catheters were optimized with respect to their real counterparts scanned in a silicone phantom using CT. The validation results show near sub-millimetre accuracy with an average distance error between the trajectories of the simulated and scanned instruments of 1.34mm (standard deviation: 0.95mm, RMS: 1.66mm). Our implementation requires just 0.2ms per time step to process 200 Cosserat elements on an off-the-shelf laptop, enabling simulation of 40cm long instruments at 4 kHz, thus significantly exceeding the minimum required haptic interactive rate (1 kHz).